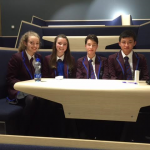 A team of four pupils, Ellen Gilmour, Auriel Guarino (both Year 10), Sarah Hadden (Year 11) and Eason Chan (Year 12) travelled to Belfast to participate in the regional finals of the prestigious Royal Society of Chemistry competition ‘Top of the Bench’ where they emerged victorious. 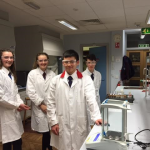 The pupils had to complete a practical task in the laboratory which demonstrated their team work and problem solving abilities before enduring two different rounds of questioning which tested the content of the GCSE specification and their general chemistry knowledge. Congratulations on being not just top of the class but top of the bench! 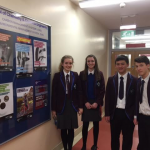 The team received individual prizes and will now represent Northern Ireland at the UK National finals in Loughborough University on Saturday 16th April 2016. Mark Collins, Chair of the RSC Local Section who organised the heats, described the team as consistently excellent throughout the night and worthy winners! We wish the team every success as they prepare for the finals of the competition.